A new kind of learning environment. Tl;dr: Using the Creative Classrooms Research model to create professional development opportunities for part-time, frontline library staff with extremely limited time available for upskilling. Recently I have presented at two virtual events – Library 2.016 and LARK (Library Applied Research Kollektive). I spoke about how I applied the Creative Classrooms Research model to the development of Library Intelligence and wanted to share a summary of these presentations here. In 2011 and 2012 I travelled all over New Zealand running workshops for library staff. During this time I received many emails from library staff desperate to learn but unable to attend because they couldn’t afford the time away from front-line duties. It wasn’t fair. So I set about to change that. I wanted to see if I could make professional development opportunities available to those ‘left behind’ – who were often part time, frontline staff with extremely limited time available for upskilling. In addition, one of the biggest barriers of online learning are the technology hassles – stuttering video, download nightmares and browser incompatibility. These limitations aren’t new. Surely there is a better way for library staff to learn. The Creative Classrooms Research model (Bocconi, Kampylis, & Punie, 2012) re-thinks learning and teaching practices to put the learner at the centre of learning and to incorporate the advantages that digital technologies offer. In 2014 Michael Stephens put forward the idea of the library as a creative classroom (Stephens, 2014). The model has 8 dimensions each connected to and reliant on each other to form a complex eco-system as shown below. Below I will illustrate how the first five dimensions have been used to create a new kind of learning environment for library staff. 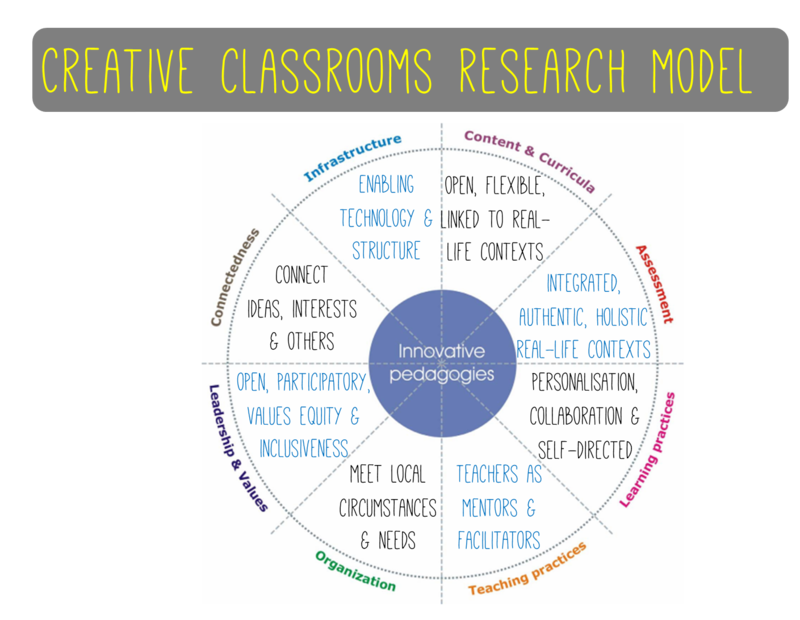 How could the Creative Classrooms model help? There were two main aspects of Content and Curricula that I found valuable. The first was the idea that learning happens horizontally across disciplines or subjects. For example knowing how to blog requires understanding and applying online communication norms which in turn requires an understanding of concepts like online identity, sharing and influence. Everything is connected and the Content and Curricula should show that. The second aspect was that any activities the learner undertakes should be meaningful. The activities “should be carried out in an authentic context, encouraging learners to apply their prior knowledge, inquiry and independent thinking in order to enhance both soft and hard skills” (Bocconi et al., 2012. p. 21.). The assessment dimension of the Creative Classrooms Research model focuses on the “conceptual shift from traditional assessment of knowledge acquisition” (Bocconi et al., 2012, p. 10.) to approaches that better capture competencies. Assessment is rare outside of formal learning. Could professional development incorporate real-life, context based, learner-centered assessments as suggested by the Creative Classrooms model? The learning practices dimension is about focusing on the experience of learning and how learners engage with it. This means learning-by-exploring to enhance critical thinking and make connections to seemingly unrelated concepts. (Bocconi, et al., 2012. p. 19.) It means learning-by-creating to reinforce real-life contexts. It means empowering self-regulated learning to help learners take control of their own learning at their own pace. (Bocconi et al., 2012. p. 20.) And it also means personalised learning with learners at the centre of the learning process, unlike many professional development activities where content is at the centre of the learning process. Teaching practices should find and share the joy, particularly in digital literacy learning. Digital literacy learners often feel frustrated because they have been unable to get a piece of technology to work or ‘dumb’ because they didn’t know all the answers to assist a library user. Teaching practices should show learners what successful learning looks like, ignite their curiosity with hands-on applications and experience and give learners the confidence to work a solution out (out of many possible solutions) for themselves. The organization dimension addresses the desire for learning to meet local circumstances and needs. How can learning be tailor-made for part-time, front-line staff with extremely limited time available for upskilling? 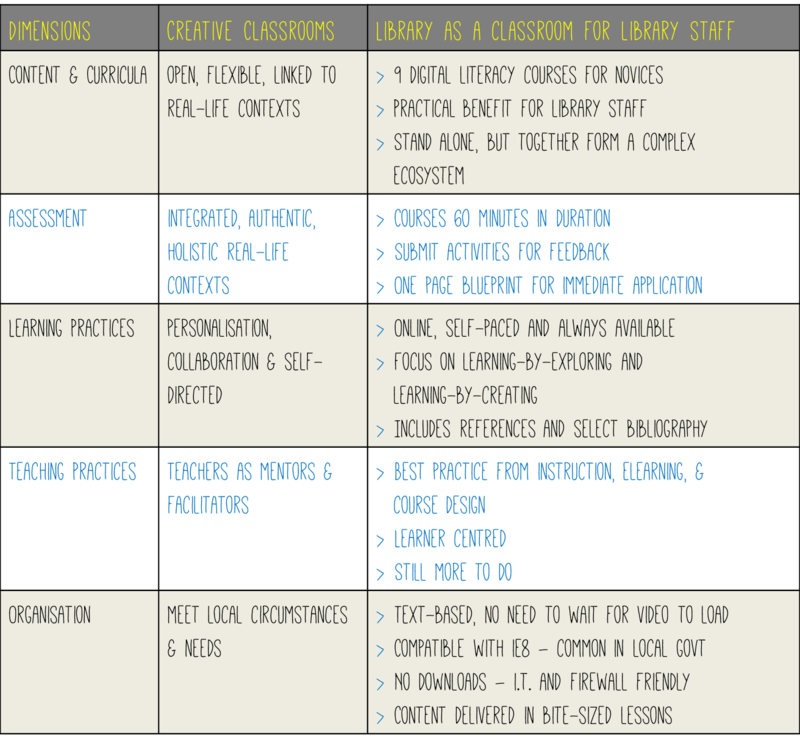 How can we build all these elements into engaging learning opportunities for library staff? Nine digital literacy courses aimed at novices that are of practical benefit to library and information professionals regardless of sector. They are stand-alone courses but if completed as a whole form a complex ecosystem much like the Creative Classrooms Model itself. Each course takes just 60 minutes to complete and requires learners to submit activities for personal feedback. Each course also includes a one-page blueprint for learners to immediately apply to their job. The courses are online, self-paced and always available. They focus on learning by exploring and learning by creating. With only 60 minutes to impart knowledge of practical value there is no time to discuss the background of a subject or the merits of a particular framework that might be used. However, each course contains references and a selected bibliography should learners wish to delve deeper. Each course is developed based on best practices from the fields of instructional design, elearning design and course design. They are learner-centred but are also a work-in-progress with the aim of including collaboration and personalisation in the future. Content is text based so you don’t have to wait ages for a video to load. They are also compatible with Internet Explorer 8 which a lot of local government bodies still use and don’t require you to download any software so should be IT-friendly and firewall-friendly. Learners are school librarians, part-time public library staff, Saturday librarians and generally library staff with very limited time available for upskilling. It is still too early to tell whether this approach has been successful but by building a platform for knowledge within the library and encouraging a mindset that the library can also be a classroom for professional development I am hopeful that it will provide meaningful outcomes for library staff and ultimately their communities.